National and international pundits all have opinions about Ferguson, Missouri. What irks Jeff Smith about much of the commentary is that it lacks a nuanced understanding of the destabilizing forces in the St. Louis suburb. Smith, a former Missouri state senator, proffered his insights in New York Times and New Yorker articles earlier this year. In the brand new e-book, “Ferguson in Black and White,” Smith, who teaches advocacy and politics at the Milano School for International Affairs, Management, and Urban Policy, delves deeper. He set out to discover what about St. Louis’s history, economics, politics, municipal structure, and culture set it apart from the myriad other cities and towns that quietly endured similar tragedies. He spoke with dozens of residents from his hometown to explore the matter further. Smith finds Monday’s announcement that the grand jury will not indict Darren Wilson for the murder of Michael Brown unsurprising. What intrigues him, rather, is how long the events have held the country’s attention. “Robust protests have spread to New York City, Los Angeles, Seattle, Miami, every corner of the country,” he said. However, he admonishes the way some outlets cover the demonstrations. “One of the most unfortunate things about the looting and occasionally violent activity is that it allows the media to shift its focus away from the critical underlying issues of racial and class inequities to an emphasis on burning buildings,” he said. Regardless of what happens next, Smith takes solace in the fact that at least people know about the Michael Brown case. “Had there been no unrest, it probably would’ve gone unnoticed outside St. Louis,” he said. To promote continued dialogue of this important issue, Smith will kickoff Ferguson in Black and White: A Discussion with Justyn Richardson, Treasurer of New Black School on Tuesday, December 2. The event will take place at 4:15pm in Arnhold Hall’s Teresa Lang Community and Student Center. 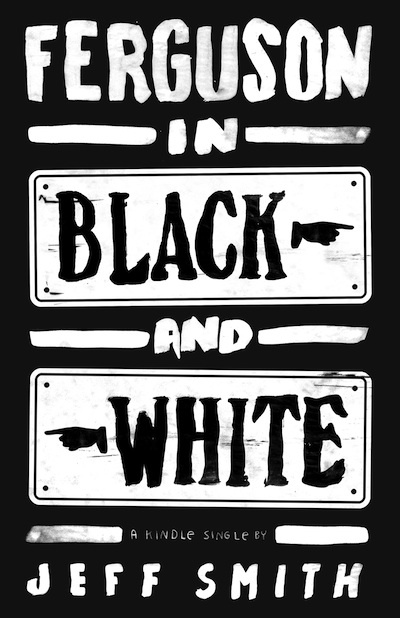 The e-book “Ferguson in Black and White” is now available on Amazon.